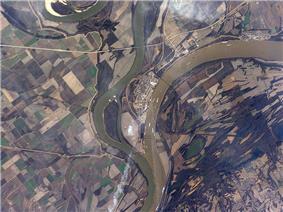 The Mississippi River is the chief river of the largest drainage system in North America. Flowing entirely in the United States (though its drainage basin reaches into Canada), it rises in northern Minnesota and meanders slowly southwards for 2,320 miles (3,730 km) to the Mississippi River Delta at the Gulf of Mexico. With its many tributaries, the Mississippi's watershed drains all or parts of 31 U.S. states and 2 Canadian provinces between the Rocky and Appalachian Mountains. 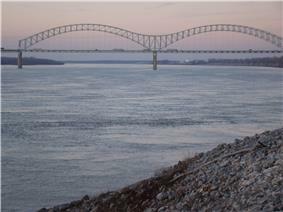 The Mississippi ranks as the fourth longest and tenth largest river in the world. The river either borders or passes through the states of Minnesota, Wisconsin, Iowa, Illinois, Missouri, Kentucky, Tennessee, Arkansas, Mississippi, and Louisiana. Native Americans long lived along the Mississippi River and its tributaries. Most were hunter-gatherers or herders, but some, such as the Mound builders, formed prolific agricultural societies. 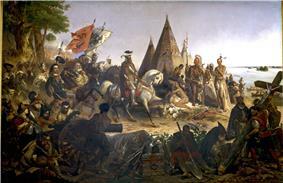 The arrival of Europeans in the 1500s changed the native way of life as first explorers, then settlers, ventured into the basin in increasing numbers. The river served first as a barrier – forming borders for New Spain, New France, and the early United States – then as a vital transportation artery and communications link. In the 19th century, during the height of Manifest Destiny, the Mississippi and several western tributaries, most notably the Missouri, formed pathways for the western expansion of the United States. Formed from thick layers of this river's silt deposits, the Mississippi River Valley is one of the most fertile agricultural regions of the country, which resulted in the river's storied steamboat era. During the American Civil War, the Mississippi's capture by Union forces marked a turning point towards victory because of the river's importance as a route of trade and travel, not least to the Confederacy. Because of substantial growth of cities and the larger ships and barges that supplanted riverboats, the decades following the 1900s saw the construction of massive engineering works such as levees, locks and dams, often built in combination. Since modern development of the basin began, the Mississippi has also seen its share of pollution and environmental problems – most notably large volumes of agricultural runoff, which has led to the Gulf of Mexico dead zone off the Delta. In recent years, the river has shown a steady shift towards the Atchafalaya River channel in the Delta; a course change would prove disastrous to seaports such as New Orleans. While a system of dikes and gates has held the Mississippi in its current channel to date, the shift becomes more likely each year due to fluvial processes. The word itself comes from Messipi, the French rendering of the Anishinaabe (Ojibwe or Algonquin) name for the river, Misi-ziibi (Great River). See below in History section for additional information. In addition to historical traditions shown by names, there are at least two other measures of a river's identity, one being the largest branch (by water volume), and the other being the longest branch. Using the largest-branch criterion, the Ohio (not the Middle and Upper Mississippi) would be the main branch of the Lower Mississippi. Using the longest-branch criterion, the Middle Mississippi-Missouri-Jefferson-Beaverhead-Red Rock-Hellroaring Creek River would be the main branch. According to either school of thought, the Upper Mississippi from Lake Itasca, Minnesota to St. Louis, despite its name, would only be a secondary tributary of the final river flowing from Cairo, Illinois to the Gulf of Mexico. While the Missouri River, flowing from the confluence of the Jefferson, Madison and Gallatin Rivers to the Mississippi, is the longest continuously named river in the United States, the serially named river known sequentially as Hellroaring Creek, Red Rock, Beaverhead, Jefferson, Missouri, Middle Mississippi, and Lower Mississippi, as one continuous waterway, is the longest river in North America and the third or fourth longest river in the world. Its length of at least 3,745 mi (6,027 km) is exceeded only by the Nile, the Amazon, and perhaps the Yangtze River among the longest rivers in the world. The source of this waterway is at Brower's Spring, 8,800 feet (2,700 m) above sea level in southwestern Montana, along the Continental Divide outside Yellowstone National Park. 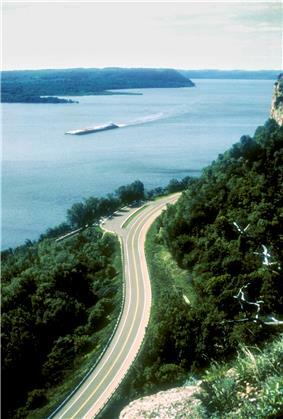 The Mississippi River is widely considered a convenient if approximate dividing line between the Eastern, Southern, and Midwestern United States and the Western U.S., as exemplified by the Gateway Arch in St. Louis and the phrase "Trans-Mississippi," as used in the name of the Trans-Mississippi Exposition. 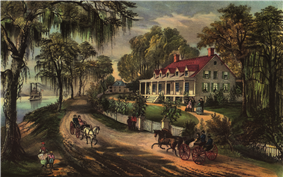 In the 18th century, the river was the primary western boundary of the young United States. The Mississippi River can be divided into three sections. 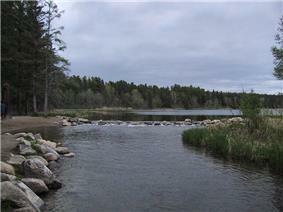 The Upper Mississippi refers to the river from its headwaters to the confluence with the Missouri River. The Middle Mississippi is that part downriver from the Missouri to the Ohio River. And the Lower Mississippi flows from the Ohio to the Gulf of Mexico. 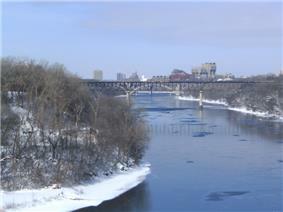 The Upper Mississippi River is joined by the Minnesota River at Fort Snelling in the Twin Cities; the St. Croix River near Prescott, Wisconsin; the Cannon River near Red Wing, Minnesota; the Zumbro River at Wabasha, Minnesota; the Black, La Crosse, and Root rivers in La Crosse, Wisconsin; the Wisconsin River at Prairie du Chien, Wisconsin; the Rock River at the Quad Cities; the Iowa River near Wapello, Iowa; the Skunk River south of Burlington, Iowa; and the Des Moines River at Keokuk, Iowa. Other major tributaries of the Upper Mississippi include the Crow River in Minnesota, the Chippewa River in Wisconsin, the Maquoketa River and the Wapsipinicon River in Iowa, and the Big Muddy River and Illinois River. The Upper Mississippi River is home to over 119 species of fish. Some fish include; walleye, sauger, large mouth bass, small mouth bass, and white bass. Northern pike, bluegill and crappie also reside in the Upper Mississippi River. Other fish like channel catfish, flathead catfish, carp, the common shiner, freshwater drum, paddlefish and shovelnose sturgeon also live in these upper Mississippi waters. The Minnesota Department of Natural Resources has designated much of the Mississippi River in the state as infested waters by the exotic species zebra mussels and Eurasian watermilfoil. 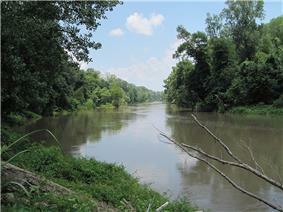 The Middle Mississippi is a relatively free-flowing river. From St. Louis to the Ohio River confluence, the Middle Mississippi falls a total of 220 feet (67 m) over a distance of 180 miles (290 km) for an average rate of 1.2 feet per mile (23 cm/km). 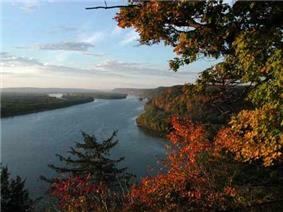 At its confluence with the Ohio River, the Middle Mississippi is 315 feet (96 m) above sea level. Apart from the Missouri and Meramec rivers of Missouri and the Kaskaskia River of Illinois, no major tributaries enter the Middle Mississippi River. 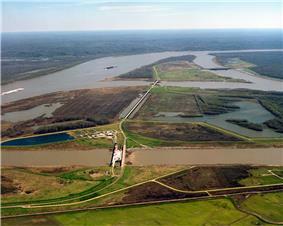 Deliberate water diversion at the Old River Control Structure in Louisiana allows the Atchafalaya River in Louisiana to be a major distributary of the Mississippi River, with 30% of the Mississippi flowing to the Gulf of Mexico by this route, rather than continuing down the Mississippi's current channel past Baton Rouge and New Orleans on a longer route to the Gulf. The Mississippi River has the world's fourth largest drainage basin ("watershed" or "catchment"). The basin covers more than 1,245,000 sq mi (3,220,000 km2), including all or parts of 31 U.S. states and two Canadian provinces. The drainage basin empties into the Gulf of Mexico, part of the Atlantic Ocean. 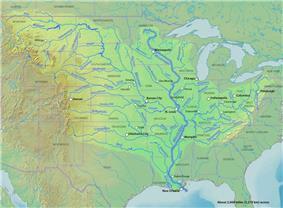 The total catchment of the Mississippi River covers nearly 40% of the landmass of the continental United States. The highest point within the watershed is also the highest point of the Rocky Mountains, Mount Elbert at 14,440-foot (4,400 m). The Mississippi River discharges at an annual average rate of between 200 and 700 thousand cubic feet per second (7,000–20,000 m3/s). Although it is the 5th largest river in the world by volume, this flow is a mere fraction of the output of the Amazon, which moves nearly 7 million cubic feet per second (200,000 m3/s) during wet seasons. 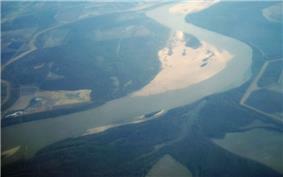 On average, the Mississippi has only 8% the flow of the Amazon River. Fresh river water flowing from the Mississippi into the Gulf of Mexico does not mix into the salt water immediately. The images from Georgia before finally mixing in so thoroughly with the ocean that it could no longer be detected by MODIS. 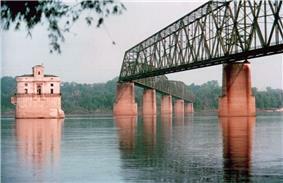 The first railroad bridge across the Mississippi was built in 1856. 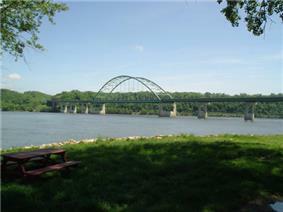 It spanned the river between the Rock Island Arsenal in Illinois and Davenport, Iowa. Steamboat captains of the day, fearful of competition from the railroads, considered the new bridge a hazard to navigation. Two weeks after the bridge opened, the steamboat Effie Afton rammed part of the bridge, catching it on fire. Legal proceedings ensued, with Abraham Lincoln defending the railroad. The lawsuit went to the Supreme Court of the United States and was eventually ruled in favor of the railroad. John James Audubon Bridge – The longest cable-stayed bridge in the Western Hemisphere; connects Pointe Coupee and West Feliciana Parishes in Louisiana. It is the only crossing between Baton Rouge and Natchez. This bridge was opened a month ahead of schedule in May 2011, due to the 2011 floods. Steamboats entered trade in the 1820s, so the period 1830 – 1850 became the golden age of steamboats. As there were few roads or rails in the lands of the Louisiana Purchase, river traffic was an ideal solution. Cotton, timber and food came down the river, as did Appalachian coal. The port of New Orleans boomed as it was the trans-shipment point to deep sea ocean vessels. As a result, the image of the twin stacked, wedding cake Mississippi steamer entered into American mythology. Steamers worked the entire route from the trickles of Montana, to the Ohio river; down the Missouri and Tennessee, to the main channel of the Mississippi. Only with the arrival of the railroads in the 1880s did steamboat traffic diminish. Steamboats remained a feature until the 1920s. Most have been superseded by pusher tugs. A few survive as icons—the Delta Queen and the River Queen for instance. 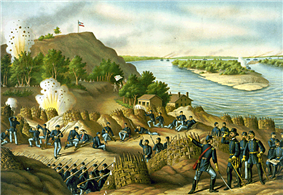 The Corps of Engineers recommended the excavation of a 5-foot (1.5 m)-deep channel at the Des Moines Rapids, but work did not begin until after Lieutenant Robert E. Lee endorsed the project in 1837. 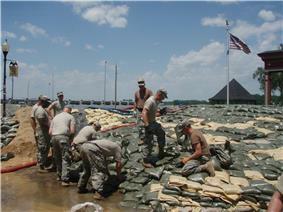 The Corps later also began excavating the Rock Island Rapids. By 1866, it had become evident that excavation was impractical, and it was decided to build a canal around the Des Moines Rapids. The canal opened in 1877, but the Rock Island Rapids remained an obstacle. In 1878, Congress authorized the Corps to establish a 4.5-foot (1.4 m)-deep channel to be obtained by building wing dams which direct the river to a narrow channel causing it to cut a deeper channel, by closing secondary channels and by dredging. 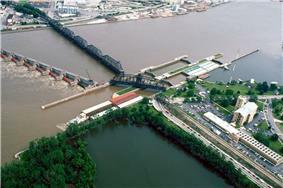 The channel project was complete when the Moline Lock, which bypassed the Rock Island Rapids, opened in 1907. In 1907, Congress authorized a 6-foot (1.8 m) deep channel project on the Mississippi, which was not complete when it was abandoned in the late 1920s in favor of the 9 feet (2.7 m) deep channel project. 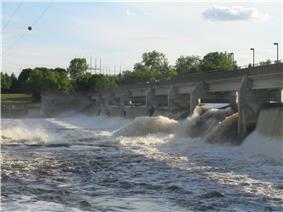 In 1913, construction was complete on a dam at Keokuk, Iowa, the first dam below St. Anthony Falls. Built by a private power company (Union Electric Company of St. Louis) to generate electricity (originally for Streetcars in St. Louis), the Keokuk dam was one of the largest hydro-electric plants in the world at the time. The dam also eliminated the Des Moines Rapids. Lock and Dam No. 1 was completed in Minneapolis, Minnesota in 1917. Lock and Dam No. 2, near Hastings, Minnesota was completed in 1930. The Rivers and Harbors Act of 1930 authorized the 9-foot (2.7 m) channel project, which called for a navigation channel 9 feet deep and 400 feet (120 m) wide to accommodate multiple-barge tows. This was achieved by a series of locks and dams, and by dredging. 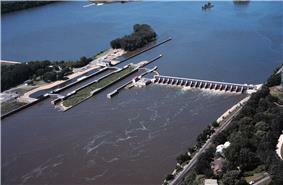 Twenty-three new locks and dams were built on the upper Mississippi in the 1930s in addition to the three already in existence. Because the large scale of high-energy water flow threatened to damage the structure, an auxiliary flow control station was built adjacent to the standing control station. This US$300 million project was completed in 1986 by the U.S. Army Corps Of Engineers. Beginning in the 1970s, the Corps applied hydrological transport models to analyze flood flow and water quality of the Mississippi. 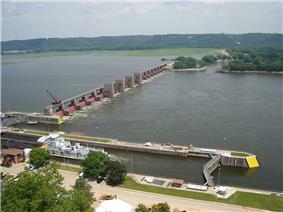 Dam 26 at Alton, Illinois, which had structural problems, was replaced by the Mel Price Lock and Dam in 1990. The original Lock and Dam 26 was demolished. The Corps now actively creates and maintains spillways and floodways to divert periodic water surges into backwater channels and lakes, as well as route part of the Mississippi's flow into the Atchafalaya River; and the Bonnet Carré Spillway, also in Louisiana, which directs floodwaters to Lake Pontchartrain (see diagram). The area of the Mississippi River basin was first settled by hunting and gathering Native American peoples and is considered one of the few independent centers of plant domestication in human history. Evidence of early cultivation of sunflower, a goosefoot, a marsh elder and an indigenous squash dates to the 4th millennium BCE. The lifestyle gradually became more settled after around 1000 BCE during what is now called the Woodland period, with increasing evidence of shelter construction, pottery, weaving and other practices. A network of trade routes referred to as the Hopewell interaction sphere was active along the waterways between about 200 and 500 CE, spreading common cultural practices over the entire area between the Gulf of Mexico and the Great Lakes. A period of more isolated communities followed, and agriculture introduced from Mesoamerica based on the Three Sisters (maize, beans and squash) gradually came to dominate. After around 800 CE there arose an advanced agricultural society today referred to as the Mississippian culture, with evidence of highly stratified complex chiefdoms and large population centers. The most prominent of these, now called Cahokia, was occupied between about 600 and 1400 CE and at its peak numbered between 8,000 and 40,000 inhabitants, larger than London, England of that time. At the time of first contact with Europeans, Cahokia and many other Mississippian cities had dispersed, and archaeological finds attest to increased social stress. On October 20, 1976, the automobile ferry, Destrehan, Louisiana, to Luling, Louisiana. Seventy-eight passengers and crew died; only eighteen survived the accident. Geologists believe that the lower Mississippi could take a new course to the Gulf. Either of two new routes – through the Atchafalaya Basin or through Lake Pontchartrain — might become the Mississippi's main channel if flood-control structures are overtopped or heavily damaged during a severe flood. Failure of the Gulf of Mexico than the present Mississippi River channel through Baton Rouge and New Orleans. While the risk of such a diversion is present during any major flood event, such a change has so far been prevented by active human intervention involving the construction, maintenance, and operation of various levees, spillways, and other control structures by the U.S. Army Corps of Engineers. Because the Morganza Spillway is located at slightly higher elevation well back from the river, it is normally dry on both sides. Even if this structure were to fail at the crest during a severe flood, the flood waters would have to cause a significant amount of erosion, down to normal water levels, before the Mississippi could permanently jump channel at this location. During the 2011 floods, the Corps of Engineers decided to open the Morganza Spillway to 1/4 of its capacity to allow 150,000 ft3/sec of water to flood the Morganza and Atchafalaya floodways and continue directly to the Gulf of Mexico, bypassing Baton Rouge and New Orleans. In addition to reducing the Mississippi River crest downstream, this diversion reduced the chances of a channel change by reducing stress on the other elements of the control system. 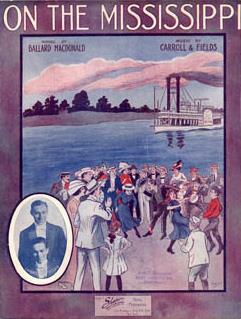 Much of Edna Ferber's 1926 novel Show Boat takes place on the Mississippi River. The novel is the basis for the celebrated 1927 musical play by Jerome Kern and Oscar Hammerstein II. The late Conway Twitty and Loretta Lynn collaborated on the song Louisiana Woman, Mississippi Man. In 2013 Michael Daugherty composed a concerto for tuba and orchestra, "Reflections on the Mississippi," inspired by sights along the Mississippi River. ^ Kammerer, J.C. (May 1990). "Largest Rivers in the United States". U.S. Geological Survey. Retrieved February 22, 2011. ^ a b c "Lengths of the major rivers". United States Geological Survey. Retrieved March 14, 2009. ^ Nell, Donald F. "The True Utmost Reaches of the Missouri". Fwp.mt.gov. Retrieved March 12, 2013. ^ "Designation of Infested Waters". ^ Middle Mississippi River Regional Corridor: Collaborative Planning Study (July 2007 update). St. Louis, Missouri, USA: U.S. Army Corps of Engineers, St. Louis District. 2007. p. 28. 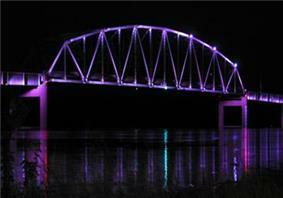 ^ "MMRP: Middle Mississippi River Partnership". Middle Mississippi River Partnership. Retrieved May 25, 2011. ^ McPhee, John (Feb 23, 1987). "The Control of Nature: Atchafalaya". The New Yorker. Retrieved May 12, 2011. Republished in McPhee, John (1989). The Control of Nature. Farrar, Straus and Giroux. p. 272. ^ "General Information about the Mississippi River". 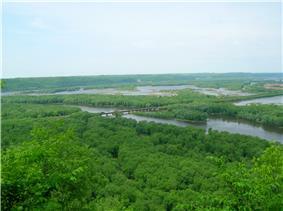 Mississippi National River and Recreation Area. National Park Service. 2004. Retrieved July 15, 2006. ^ "ARKANSAS V. TENNESSEE, 246 U.S. 158 :: Volume 246 :: 1918 :: Full Text :: US Supreme Court Cases from Justia & Oyez". Supreme.justia.com. Retrieved March 12, 2013. ^ Costello, Mary Charlotte (2002). Climbing the Mississippi River Bridge by Bridge, Volume Two: Minnesota. Cambridge, MN: Adventure Publications. ^ "US Army Corps of Engineers, Brief History". Usace.army.mil. Retrieved November 6, 2010. ^ "U.S. Waterway System Facts, December 2005" (PDF). USACE Navigation Data Center. Retrieved April 27, 2006. ^ "The Mississippi and its Uses". Natural Resource Management Section, Rock Island Engineers. Retrieved June 21, 2006. ^ "Appendix E: Nine-foot navigation channel maintenance activities". National Park Service, Mississippi National River and Recreation Area Comprehensive Management Plan. Retrieved June 21, 2006. 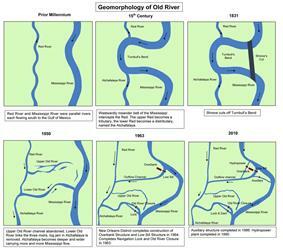 ^ "History of the Mississippi River and Tributaries Project". US Army Corps of Engineers New Orleans District. ^ P. J. Richerson, R. Boyd, and R. L. Bettinger, "Was Agriculture Impossible During the Pleistocene but Mandatory during the Holocene? A Climate Change Hypothesis", American Antiquity 66: 387–411, 2001. ^ Pauketat, Timothy R. (2003), “Resettled Farmers and the Making of a Mississippian Polity”, American Antiquity, Vol. 68, No. 1. ^ Pauketat, Timothy R. (1998), “Refiguring the Archaeology of Greater Cahokia”, Journal of Archaeological Research, Vol. 6, No. 1. ^ Sullivan, Lynne P., Archaeology of the Appalachian highlands, University of Tennessee Press, 2001, ISBN 1-57233-142-9. ^ "Jolliet and La Salle's Canal Plans". Encyclopedia.chicagohistory.org. Retrieved November 6, 2010. ^ "Illinois & Michigan Canal National Heritage Corridor". Nps.gov. August 24, 1984. Retrieved November 6, 2010. ^ "Plan of New Orleans the Capital of Louisiana; With the Disposition of Its Quarters and Canals as They Have Been Traced by Mr. de la Tour in the Year 1720". ^ "Southeast Missouri State University: The Big Freeze, 1918–1919". Semo.edu. Retrieved November 6, 2010. ^ Manulik, Joseph (October 29, 2012). "Mississippi River Oil Spill, 1962–1963". MNopedia. ^ UA-WRI Research Station, Historical Archeology. "Ghost Boats of the Mississippi". ^ "Source to Sea". Source to Sea. Retrieved March 12, 2013. 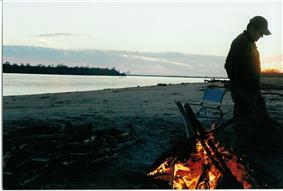 ^ "Paddling the Mississippi River to Benefit the Audubon Society". 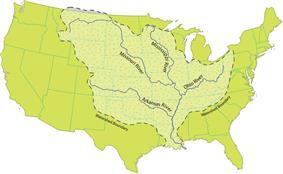 Source to Sea: The Mississippi River Project. Source to Sea 2006. 2006. Retrieved November 29, 2006. ^ "Morganza ready for flood | The Advertiser". theadvertiser.com. May 12, 2011. Retrieved May 16, 2011. Anfinson, John O.; Thomas Madigan; Drew M. Forsberg; Patrick Nunnally (2003). The River of History: A Historic Resources Study of the Mississippi National River and Recreation Area. 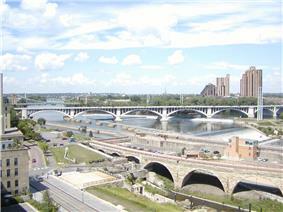 St. Paul, MN: U.S. Army Corps of Engineers, St. Paul District. Bartlett, Richard A. (1984). Rolling rivers: an encyclopedia of America's rivers. New York: McGraw-Hill. Milner, George R. "The late prehistoric Cahokia cultural system of the Mississippi River valley: Foundations, florescence, and fragmentation." Journal of World Prehistory (1990) 4#1 pp: 1-43. Penn, James R. (2001). Rivers of the world: a social, geographical, and environmental sourcebook. Santa Barbara, Calif.: ABC-CLIO. Smith, Thomas Ruys (2007). River of dreams: imagining the Mississippi before Mark Twain. Baton Rouge: Louisiana State University Press. Scott, Quinta (2010). The Mississippi: A Visual Biography. Columbia, Missouri: University of Missouri Press. Pasquier, Michael (2013). Gods of the Mississippi. Bloomington: Indiana University Press.